Okay, this I understand. It's the grass is always greener on the other side of the fence thing. It's this I don't get. This is her bowl of treats, in her pen, and she knows perfectly well she could just walk right around that panel to reach it. Oh, I see. It's a llama thing. Susan, your blog is great and I think you are an interesting farm girl. Hats off! I've really enjoyed your pictures and stories that go along with them. 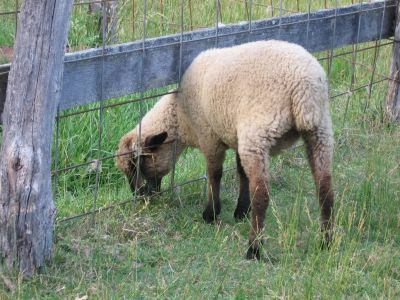 I live in a rural area, with a sheep pasture right on the other side of our back yard. I've seen so many babies and have adored each of them. I came here from San Diego, ready for a more serene life. I've never looked back. Your farm life sounds wonderful! Thank you for the blessings this morning. This is a great blog. I'm so glad I came across it. I grew up on a sheep, dairy, pig, cash crops farm. We had every animal imaginable. Chickens, ducks, geese, horses (my favorite) and more. 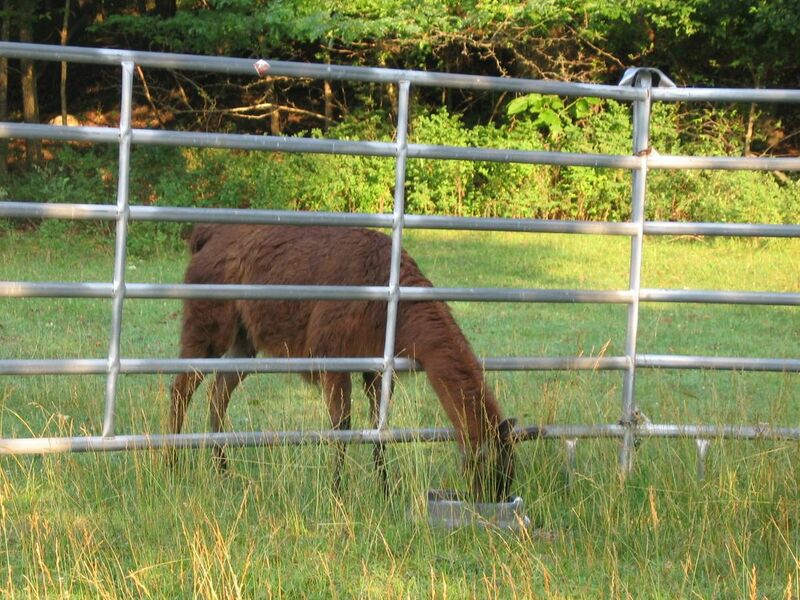 I love the llama photos too. My job on the farm was taking care of our 50+ head of sheep and training my border collie on them too for competition. I'm hoping to get some pictures of my old dogs to post on there real soon. Take care! I look forward to revisiting! 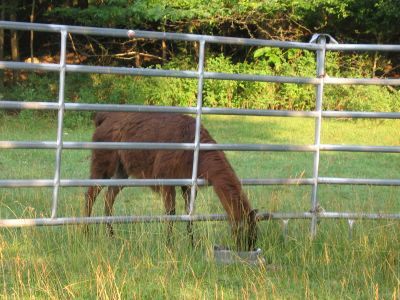 you must see this if you have a Llama..it is so cute - not that your aren't.......but this is too funny. I just love you Blogg! I found it by looking at the "updated blogg "section and thought. WOW someone like me , lets take a look. Although I have not done as well on my blogg and at 56 I think the life style changes were more of a shock, but, hee hee hee, after a year and a half, I am still struggling along and stepping in "cow pies". I check in just about every day and finally talked my roomie into explaining "blogging" to me, (I was raised in the 80's and we used an abacus! )so I could tell you how much I enjoy your site. Thank you from the bottom of my techno-nerd heart! Muy bello blog. 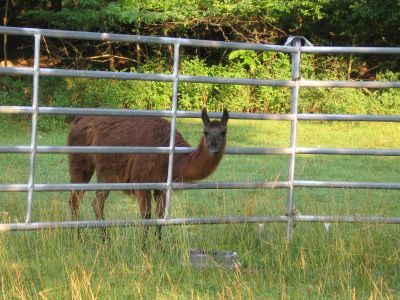 Tras echar un rápido vistazo, me sorprendió encontrar la imagen de una llama. Felicidades. You do know I'm expecting at least one of the llamas to be named after me...right? Why is it that I tend to see t-shirts everywhere? I hardly ever wear any but plain ones any more, due to the ridiculousness issues which arise with age. But I can't get the Uncle Dan one ("I could have slept in the shed") out of my head, and now I'm seeing "It's a Llama thing" shirts, too. BTW,I think it would be very appropriate to name the llamas "Lindy: and "Jeff". We might even stop nagging you-though I doubt if the chickenz ever will. Can't speak for them, of course. Heh, heh. Have you ever seen the Llama Song? i am new to the game but your pictures were telling !amm looking forward to the next set...keep clicking!